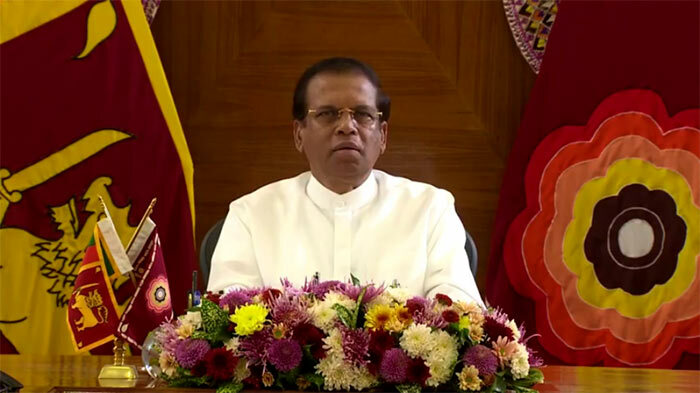 Issuing a special statement, President Maithripala Sirisena addressed the nation last evening (11) with regard to the dissolution of the parliament. This is the third occasion in 14 days I am addressing you to explain recent developments. First, on October 26 I explained my views to you after appointing Mr. Mahinda Rajapaksa as Prime Minister. We have experiences about several political crisis and changes in the past. I remember the political crisis due to the opposition to the Lake House Bill in 1964. The government was changed due to that. However, since 1947 we have not seen of dissolution of parliament due to issues of corruption. The Central Bank robbery after 2015, the involvement in various corrupt practices since then and finally the political crisis during the attempts to show the majority support after the appointing of Mr. Mahinda Rajapaksa as Prime Minister and the value placed on Members of Parliament as I mentioned earlier were extremely unfortunate developments. All of you will acknowledge what a tragical situation in politics when the value of the Members of Parliament, who were elected to represent the people, were commercially evaluated. That was one of the main reasons for the dissolution of the Parliament. The second reason was the most peculiar behavior of the former Speaker, Mr. Karu Jyasuriya. I am extremely sad about that. He is a good friend of mine. The Speakers of our Parliament since 1947, until now, traditionally conducted themselves in neutral and most impartial manner. I wish to state, that his behavior of disregarding Standing Orders and Parliamentary Conventions and attempting not to recognize the appointment of a Prime Minister by the President exercising his Presidential powers was the second reason for dissolving the Parliament. I must remind you here that, as we take the situation in to account politically, following my victory on 2015 January 08th, when I appointed Mr. Ranil Wickremasinghe as the Prime Minister on the very next day, he had the support of a mere 41 members in the Parliament, whereas the sitting Prime Minister D.M. Jayaratne had the support of 162 members in the Parliament. At that moment, as you know, those who talk about the majority today, were silent about that. Often, the custom is to appoint among the members of the Parliament, someone whom the President, in his opinion, can trust to get the support of the majority in accordance with the constitution. Following that appointment, the support of the majority is obtained in terms of the standing orders of the Parliament and in the Constitution of the country. However, in our Parliamentary tradition, there has been no occasion on which the majority support for a newly appointed Prime Minister has been tested by vote. Nothing of the sort happens under the standing orders. However, the second statement by Hon. Karu Jayasuriya violated those traditions. In his first statement, he accepted the appointment of Mr. Mahinda Rajapaksa as Prime Minister and stated that he would provide the rights and the privileges of the Prime Minister to him in the Parliament. That means, specially reserving the seat of the Prime Minister and the Office of the Prime Minister in the Parliament. His first press statement admitted this. However, his second statement was a complete deviation from it. In that he stated that he recognizes Mr. Ranil Wickremasinghe as the Prime Minister. I paid serious attention to this development. Members of Parliament from both sides issued various statements in media, that there would lead a big fight when the Parliament is convened on the 14th November. Some speculated that even death of some members would occur. Accordingly, we provide fullest cooperation to the Election Commission, Public Officials, Police and Tri Forces to conduct the elections. It is the responsibility of the Party Leaders, Ministers former MPS, candidates and the supporters and the public to ensure that elections are conducted peacefully without any acts of violence and conduct election by acting with dignified and responsible manner. While reminding all these, I urge you most respectfully to extend fullest cooperation to the efforts to take our great Motherland to be a peaceful, progressive and economically prosperous nation with a great governing structure and an ethical, cultured society that preserve our heritage, customs, traditions, ethics and culture. Only bloggers INDRA and AMARAKOON read your rubbish! By the way, I don’t belong to the Samanela Kalliya! I had to say Darling to you because of my eternal love to you. Yes, Indra has no a balanced critique but appears always for Mahinda Rajapakse for long time. President Maithripala Sirisena and Mahinda Rajapaksa have decided to contest under the ‘Nidahas Podujana Peramuna’ (NPP) banner at the upcoming parliamentary polls. Accordingly, the new symbol will be unveiled during the next few days. The decision to contest under the NPM banner was reached following discussions that took place between members of the SLFP and the SLPP at the Presidential Secretariat yesterday ( Nov 12). Will CBK participate in this venture? Are you a leader or a bitter little child stomping your feet because things didn’t go your way? Your name is tarnished and you will never come back from that. Mahinda is absolutely lucky to have you to take the fall. I feel sorry for your generations to come because ‘your story’, won’t be a great one. Pity you, fool!